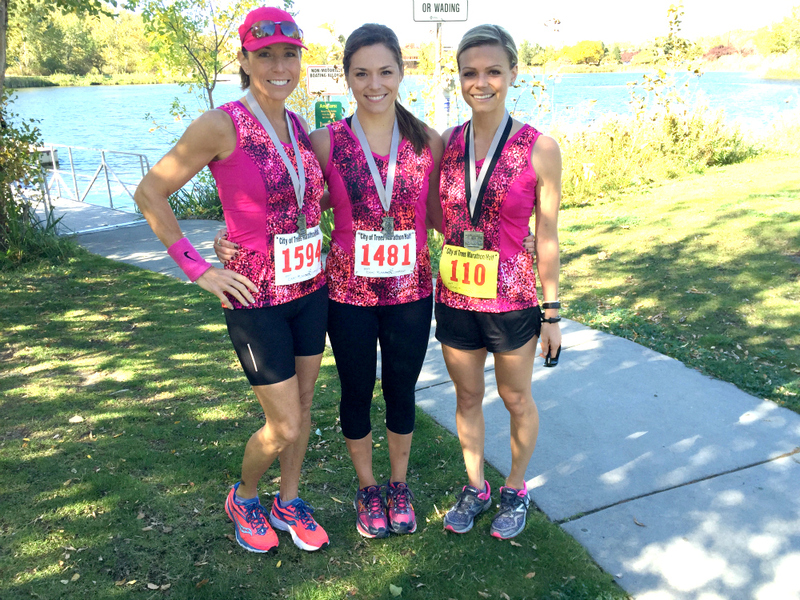 This past weekend I had the opportunity not only to compete in my second full marathon, but I got to run in a race with my mom and sister! Originally, I had planned on running The City of Trees Marathon by myself because I thought my mom was going to be out of town, so I went ahead and registered for the full with the rationale of "Why not? 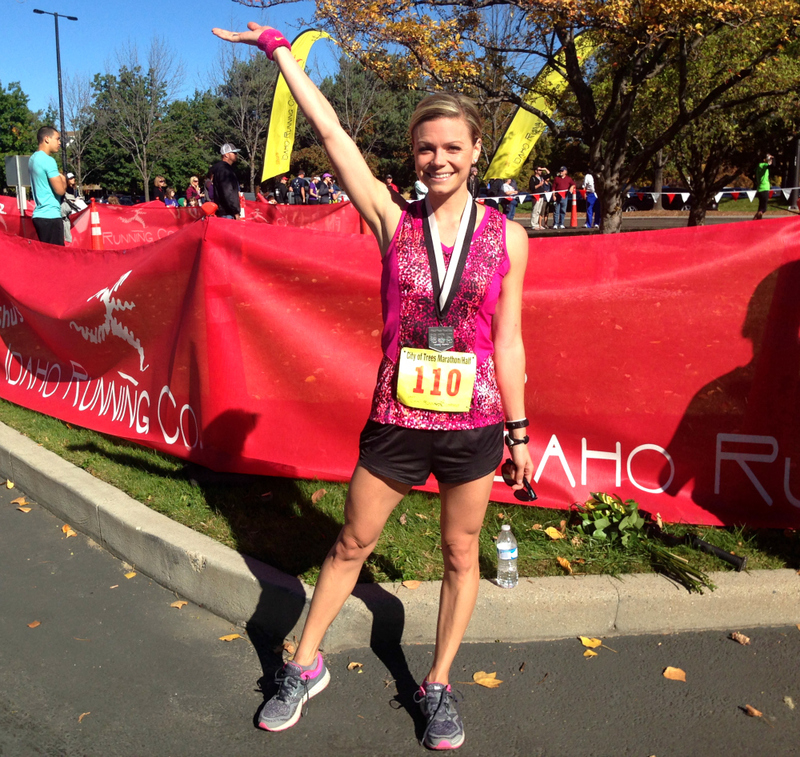 I've trained for half marathons all year so let's see what I can do," fueling my fire. When my mom and sister found out I signed up for the full 26.2, they figured they needed to get in on the action and register for the half! 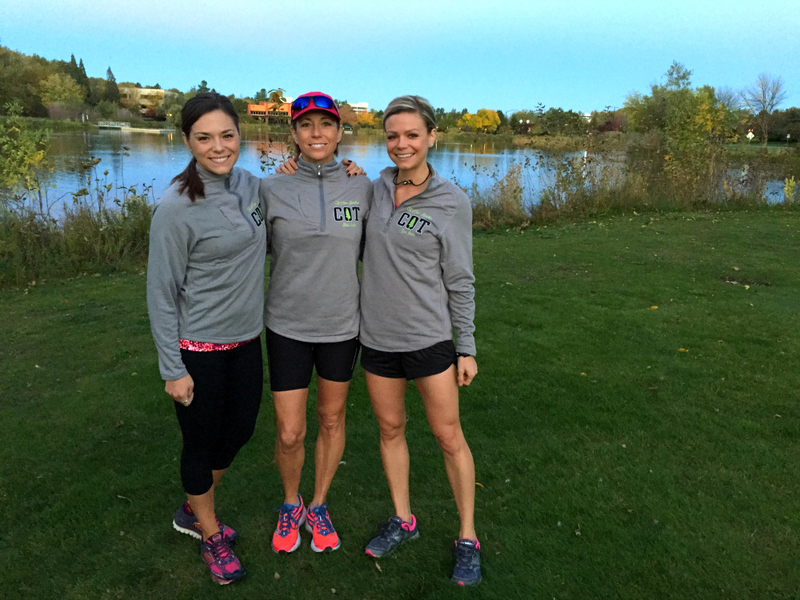 So my sister, who lives in Seattle, flew in and the three of us were able to run our very first race together! The marathon began at 8:00 am with the half beginning an hour later at 9:00 am. Marnie and Mom went with me to the start, cheering me on as the starting horn sounded. 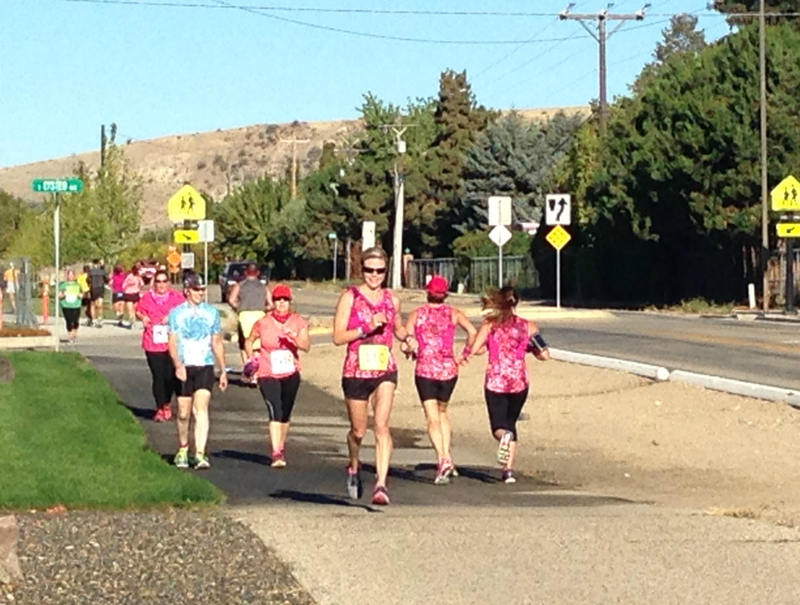 The marathon's course (which had changed since I ran it in 2013), took us west on the Boise River Greenbelt for half of the race and then joined back up going east with the half marathon route. 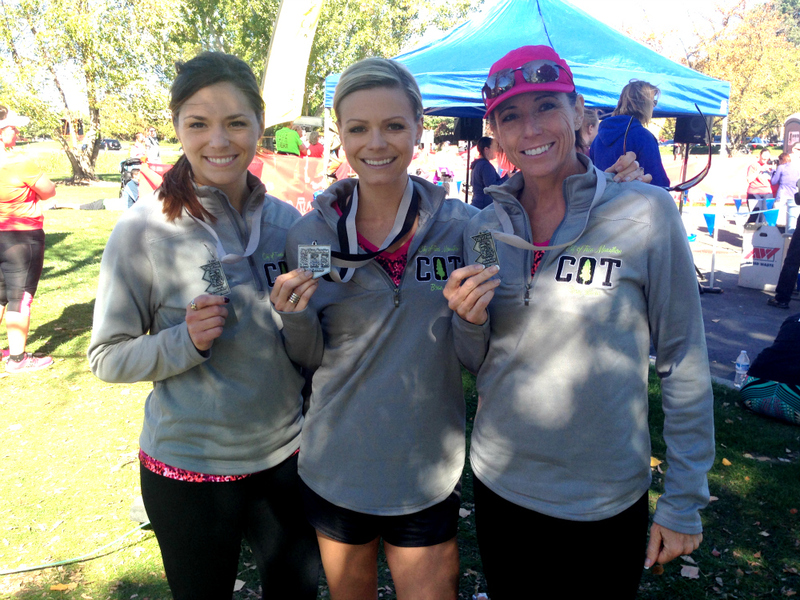 What was cool was that I got to run past my mom and sister along the course! I really liked that aspect of the out & back course... there was almost always someone around you, no matter what distance or mile you were running. My sister and my mom ended up having a great race, finishing in 1:54:08. This was my sister's first half marathon, and—despite what she's telling us at this moment—I don't believe it will be her last! She and my mom were a dynamic team and I'm so glad they got the chance to run together. Despite only training for half marathons this year, I figured I'd be in okay enough shape to be able to complete the full. I set out with a goal in mind of 3:30 (8:00/mile average), 5-minutes under the Boston Qualifying time for my age group. 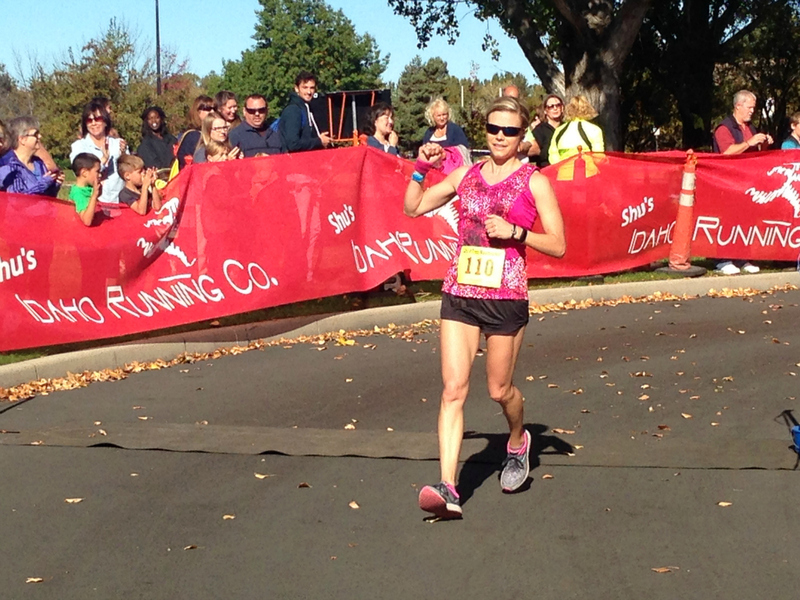 I ended up having a better race than I had planned for (until about mile 22 that is!) and finished as the 2nd Overall Female with a time of 3:16:43, averaging exactly 7:30/mile. 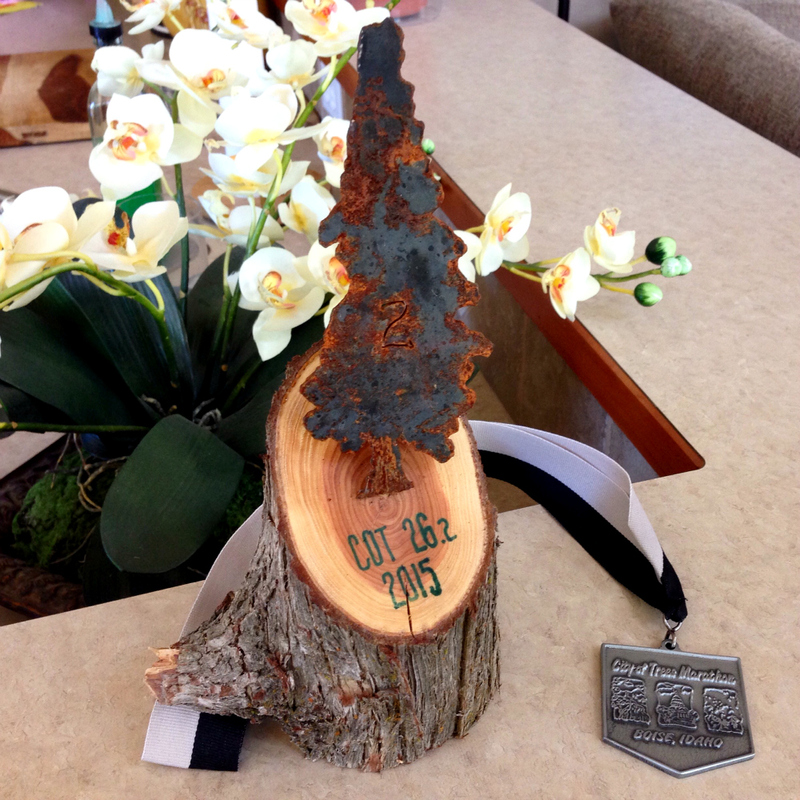 I definitely set out just to run this race and didn't intend on competing or placing, so I was absolutely surprised to take home a beautiful handmade trophy and a BQ, which I exceeded by almost 20-minutes! Woo-hoo! As I have a mantra with every race, this race was not about placing, or winning, or anything fancy. 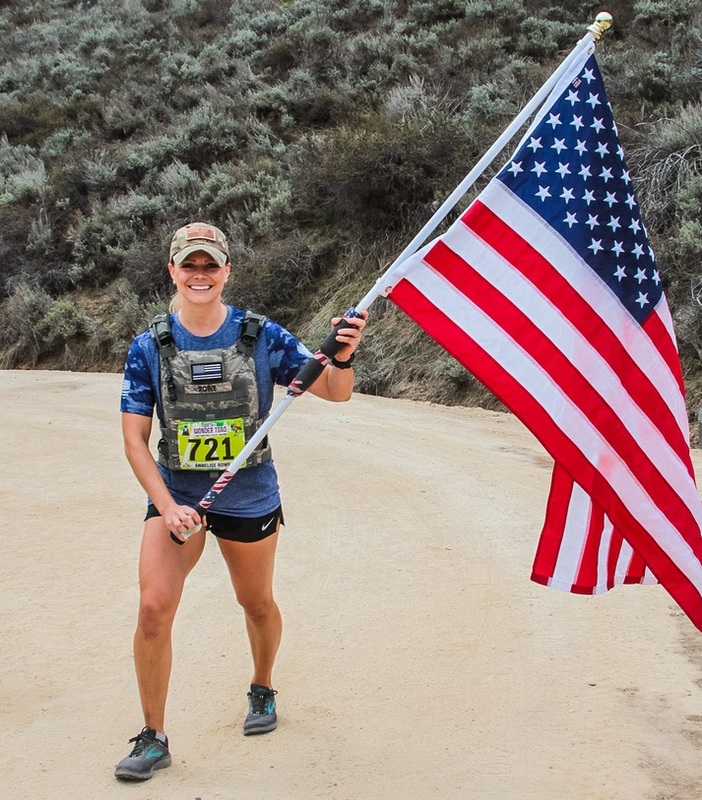 At about mile 20—when it started to hurt—I began repeating over and over, "This is MY race." The intent behind the mantra was that I wasn't doing it for anyone else but myself. I didn't care about the place, or the pace, or anything... I just wanted to do this for me. And I tell you what, that mantra helped carry me through the finish. That, and A LOT OF PRAYER—of course! 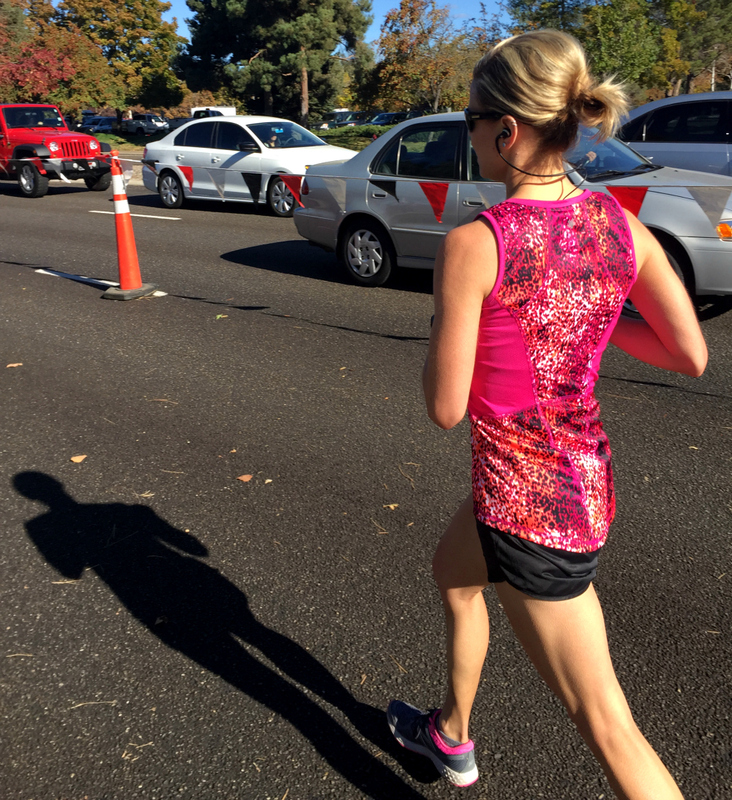 See more photos from the race below, captured by my sweet husband and brother-in-law, who cheered the three of us on the entire way! Mom and Marnie cheered me on at the start! It was a bit chilly to begin with but quickly warmed up to a comfortable temperature. We were ready to run! 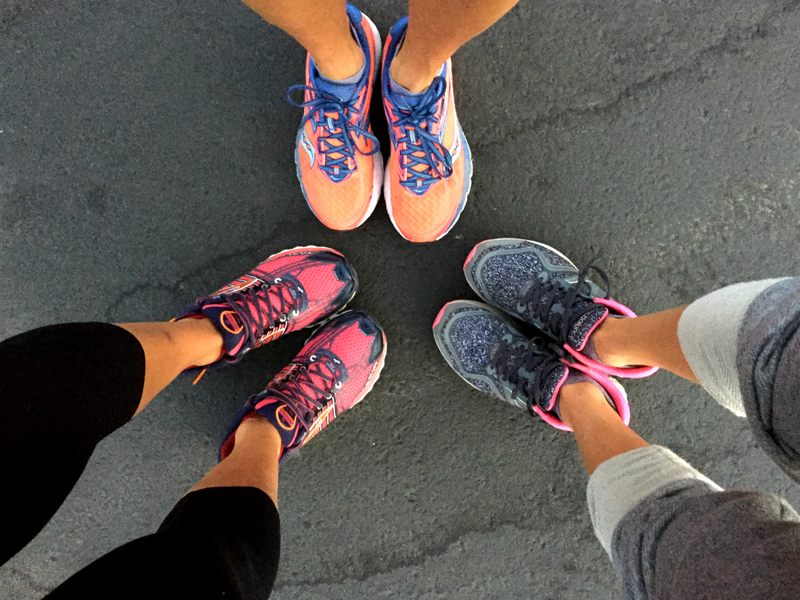 Marnie was in Brooks, Mom in Saucony, and I'm in New Balance! All lined up at the start! My husband asked, "Why do you always start in the front?" My response was, "Why not—someone's gotta do it?!" I was fortunate to run about 10-miles with this superstar, Audrey, who was running her very first marathon and ended up winning 1st Overall Female with a time of 3:06. She came up behind me around mile 7 and asked if we could run together. Not only did we run, but we chatted and kept each other around 7:05/mile splits for about 10 miles. I was ready to slow it down just a bit (aka I couldn't hold that pace any longer) around mile 18 so she took off and totally killed it! She was a doll and I was so glad to be able to get to spend some time with her. One of my favorite shots of the day. 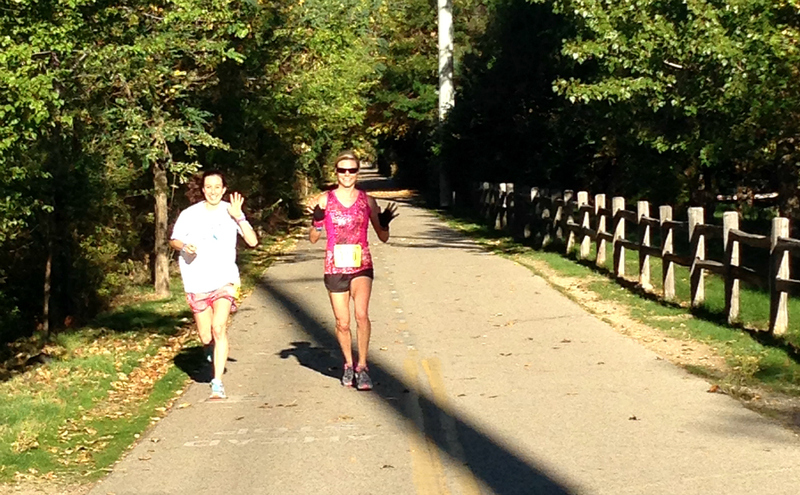 I had just high-fived my mom as she and my sister were heading into their last few miles. I still had plenty to go but it totally jazzed me up to get to see them along the course! Coming around to the finish. I was so excited to be done! My pace at this point was definitely about 9:00/mile... every step felt like that could be my last. I was toast! Running across the finish. I achieved 2nd Overall Female with a time of 3:16:43 (7:30/mile average), a new personal record by 47-minutes! The awesome award, which was hand-crafted! Isn't it beautiful? I couldn't have asked for a better race. A BQ and a family event? It just doesn't get much cooler. While I definitely didn't anticipate earning a Boston Qualifying time, I truly didn't anticipate what mental game the race was going to be. I definitely cruised through the first 20 miles, but the last six were very, very mentally and physically challenging for me. Earning a BQ is—to me—a true honor in itself. Now, whether or not I'll actually run the Boston Marathon... that's a whole different conversation. I am not certain what this next year holds for racing, military training, or vacation plans, so I don't anticipate making that decision quite yet. All I know for now is that it's pretty darn cool that I was at least able to qualify. My true favorite part of this race wasn't the medal or the award or the BQ or the freakin' awesome sweatshirt (which is really why I signed up for the race in the first place). My favorite part was seeing my mom and sister on the course, high-fiving them as I ran through the finish, and getting to have my sister come be a part of this family race tradition my mom and I have started. When you love doing something so much and you are able to share it with the people you love so much, there's just something there that makes your heart quadruple in size. 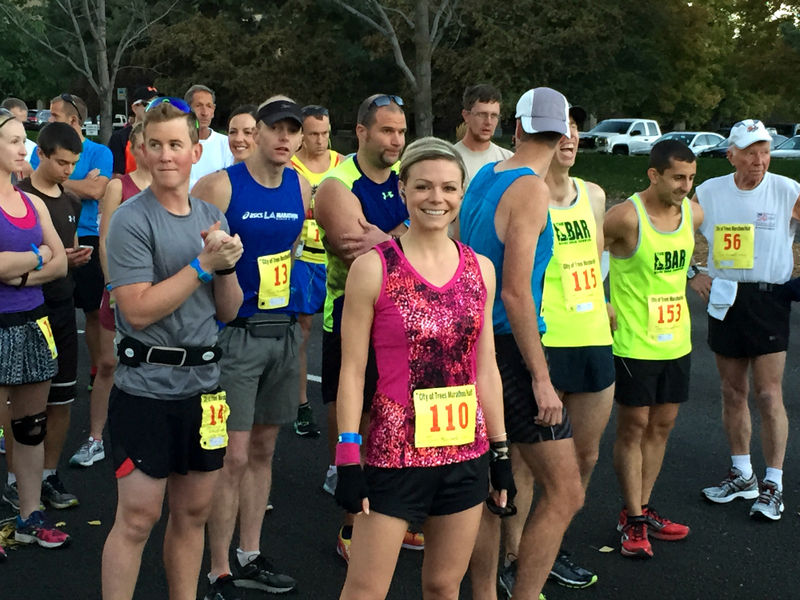 I'm not yet certain whether this is my last race for 2015 or not, but regardless, it was an awesome one. COT for the win!